The FTD Pick-Me-Up bouquet is a colorful flower bouquet to pick up anyone's gloomy day. 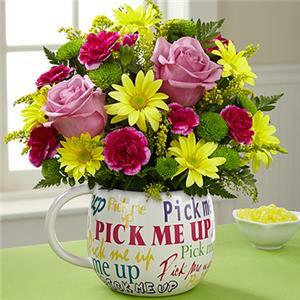 A get well soon flower arrangement made with bright yellow daisies, green mums, magenta carnations, and pink roses. Colorful flower bouquet to pick up anyone's gloomy day. Made with bright yellow daisies, green mums, magenta carnations, and pink roses.